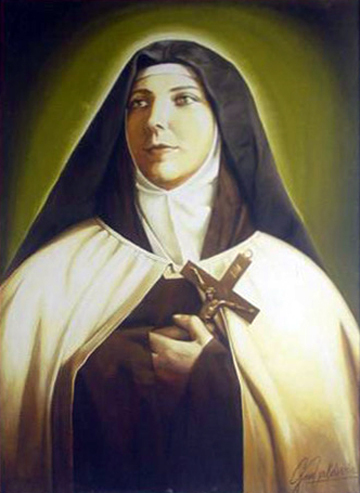 St. Teresa of the Andes, professed Discalced Carmelite nun, born July 13, 1900. She died April 20, 1920, just before her 20th birthday. “Jesus alone is beautiful; he is my only joy. I call for him, I cry after him, I search for him within my heart. I long for Jesus to grind me interiorly [like wheat] so that I may become a pure host where he can find his rest. I want to be athirst with love so that other souls may possess this love. I would die to creatures and to myself, so that he may live in me. Is there anything good, beautiful or true that we can think of that would not be in Jesus? Wisdom, from which nothing would be secret. Power, for which nothing would be impossible. Justice, which made him take on flesh in order to make satisfaction for sin. Providence, which always watches over and sustains us. Mercy, which never ceases to pardon. Goodness, which forgets the offenses of his creatures. Love, which unites all the tenderness of a mother, of a brother, of a spouse, and which, drawing him out of the abyss of his greatness, binds him closely to his creatures. Beauty which enraptures…what can you think of that would not be found in this Man-God? Are you perhaps afraid that the abyss of the greatness of God and that of your nothingness cannot be united? There is love in him. His passionate love made him take flesh in order that by seeing a Man-God, we would not be afraid to draw near hm. This passionate love made him become bread in order to assimilate our nothingness and make it disappear into his infinite being. This passionate love made him give his life by dying on the Cross. Are you perhaps afraid to draw near him? Look at him surrounded by little children. He caresses them, and presses them to his heart. Look at him in the midst of his faithful flock, bearing the faithless lamb on his shoulders.